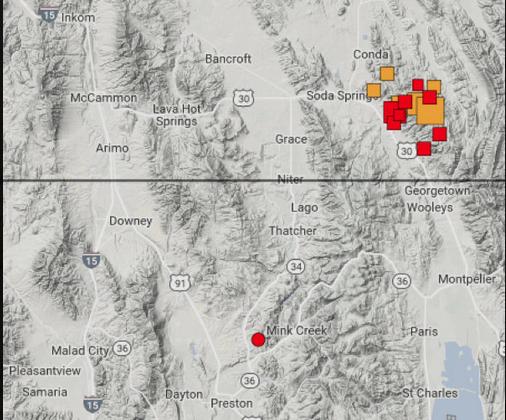 The red and orange areas show the epicenters of the 16 earthquakes that occurred Saturday evening in Southeast Idaho and northern Utah. More quakes could be incoming. The strongest earthquake to hit the region in years as well as 15 smaller quakes occurred Saturday evening in Southeast Idaho and northern Utah. Authorities said it did not appear that the quakes caused any injuries to people or damage to structures (ADVICE ON WHAT TO DO IF AN EARTHQUAKE HITS YOUR TOWN IS AT THE END OF THIS ARTICLE). The quakes were felt in Caribou County, where 14 of them occurred, as well as in cities in northern Utah and throughout Southeast Idaho. The 16 earthquakes occurred starting shortly before 6 p.m. Saturday and the most powerful was about 20 miles east of Soda Springs and registered as 5.3 on the Richter scale — strong enough to damage buildings. It's been years since Southeast Idaho has experienced a quake of over 5.0 on the Richter scale. The earthquakes continued until 8:14 p.m. Saturday, according to the University of Utah, but there could be more incoming. All of the quakes occurred in Southeast Idaho except for one that was in northern Utah just south of the Idaho state line near the city of Franklin, Idaho. The 14 Caribou County earthquakes occurred at various distances east and southeast of Soda Springs, the county's largest city. The farthest away was about 25 miles southeast of Soda Springs and the closest was about 4 miles east of the city. One earthquake occurred about 7 miles northeast of Preston in Franklin County. It was the last quake to be reported — at 8:14 p.m. Saturday. The quakes were felt as far away as Logan and Ogden in northern Utah and Pocatello, Chubbuck, American Falls, Fort Hall, Aberdeen, Blackfoot and Springfield in Southeast Idaho. Consult a structural engineer to evaluate your home and ask about updates to strengthen areas that would be weak during an earthquake.When choosing your home or business to rent or buy, check if the building is earthquake resistant per local building codes. When the shaking stops, look around. If the building is damaged and there is a clear path to safety, leave the building and go to an open space away from damaged areas. Check for injuries and provide assistance if you have training. Assist with rescues if you can do so safely. If you are near the coast, learn about tsunamis in your area. If you are in an area that may have tsunamis, when the shaking stops, walk inland and to higher ground immediately. Monitor official reports for more information on the area’s tsunami evacuation plans.